A priest from Canada and a priest from the states walk into a bar... Annnnd I can't think of a joke. This weeks episode brings EXTRA Clericalism, featuring a third priest! @tweetmobb joins @FatherSciarappa and @FrHarrison. Fr. Anthony and Fr. Harrison dive into the pains and struggles of priesthood in a revealing episode of the podcast. E26: What do you do when @FrHarrison has the Flue? Record with Producer @PappaSciarappa and @FatherSciarappa of course! So, what are your thoughts on thinking? 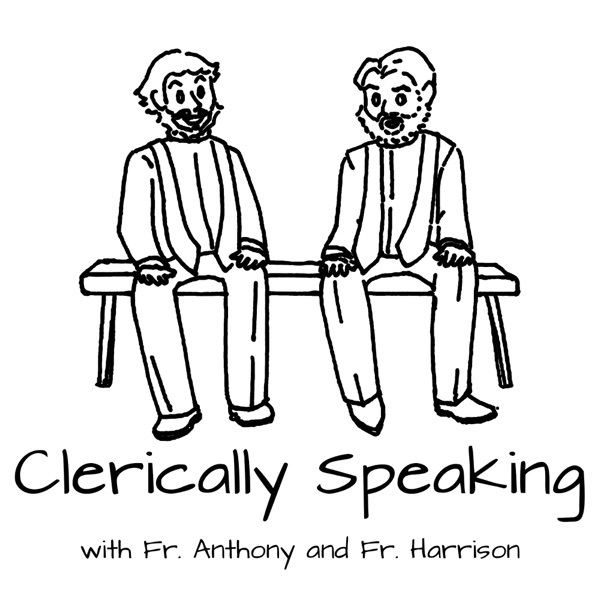 @FatherSciarappa and @FrHarrison discuss the Catholic Intellectual Life in E25! E24: You sinned? One million Hail Marys for you! @FatherSciarappa & @FrHarrison talk penance... And there's a new bumper! How do you get a ticket to BLOCK CITY from a Priest on Twitter? Ask @FatherSciarappa and @FrHarrison. Also: Cry Rooms, Cigarettes and more! Preaching! Homilies! Sermons! Oh my! In Episode 21, @FrHarrison & @FatherSciarappa break down what homilies are REALLY supposed to be. BATMAN! In a lighthearted Christmas episode, @FatherSciarappa & @FrHarrison talk about batman, masculinity and much more! Can the Trads handle a podcast on Lefebvre? @FatherSciarappa & @FrHarrison can! Vatican II, Santa and so much more!